Woo hoo! Miracles do happen! It is snowing!!! The ground and road is covered now and we could get up to 8" by tomorrow afternoon. :) We haven't had that much snow in over 10 yea rs! The first flakes started falling at 1:40 PM (not that I was anxious or anything!) and as soon as I finished eating lunch, I put on my warm clothes and headed outside with my tripod and camera. Since it was a bit warmer than a couple of weeks ago, the snowflakes were different. Many of them were just flat, hexagonal plates. Others were 6-sided columns that looked like an hourglass. 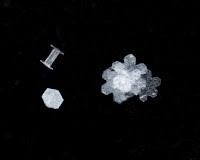 The photo on the left shows 3 different kinds of snowflakes. Some of them were mis-shapen and funny looking! (right) I'm anxious to take some more photos tomorrow. I also enjoyed watching the birds at the feeder. 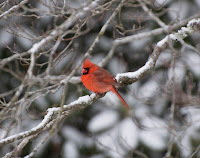 The male cardinals were so handsome in the snow! I saw a new (to me here in TN, I saw it in TX last spring) bird at the feeder before it started snowing. 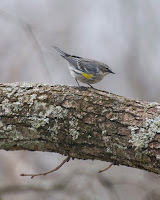 It was a Yellow-rumped Warbler. Tomorrow night is a full moon, that will be a real treat if the clouds clear away! I hope it snows all night tonight!